Does your little boy lip-synch to the hits of Super Junior? Does your little fashionista dress like the rest of the girls of 2NE1? Then, let their inner superstars out for a shot at the spotlight and the 100 thousand peso grand prize! Have them join the Search for the SM Toonfest K-Pop Rising Star! SM Department Store, the country's leading department store introduces K-Pop style into this season's toon fashion collection. Your kid's favorite cartoon characters such as Garfield, Micky Mouse, Snoopy, and Barbie are made glitzy, glam, funky, and spunky with bright colors and bold patterns associated with Korean fashion. SM Toonfest also carries other character apparel such as Hello Kitty, Robbie Rabbit, Winnie the Pooh, and Marvel Superheroes. The Disney Princesses, Disney Fairies, and the Sesame Street gang are also featured apparel collections. 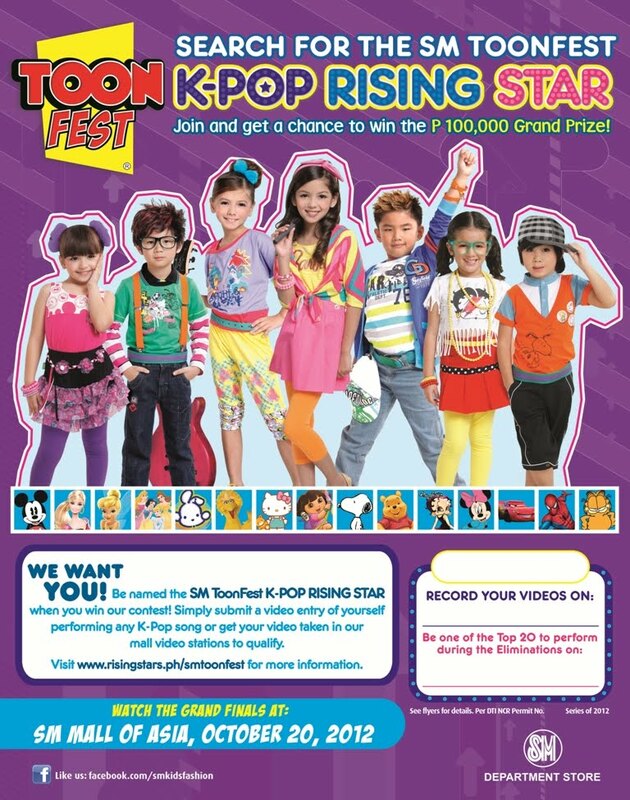 The Search for the SM Toonfest K-Pop Rising Star is a song, dance, and lip-synch competition open to boys, girls, and groups aged 2 to 14 years old. The grand finals will be held at the SM Mall of Asia on October 20, 2012. To know how your kids can audition and for more details on the contest, kindly visit www.risingstars.asia/smtoonfest and www.facebook.com/smkidsfashion. hmmm...ok sana ito kaso my Tiki is too young for this.